Finally the CM12S Android lollipop OTA update is available for the OnePlus one users. Most of the users already received the OTA updated on their devices and enjoying the new Lollipop on the device. Here in this guide we’ll show you how you can easily install the latest CM12S update manually on your Oneplus one. The ROM comes with lots of new features and improvements and this one is not the CUstom ROM, its the officiall one and only for the Oneplus one users. If you can’t wait for the OTA update, follow the below mentioin guide and update you phone with this latest official update. The process is very simple and takes a few mintutes to flash the same. NOTE:- Before following the guide do take the full backup of you phone and store in some safe place. After that read all the instruction very carefully and follow them step by step. Step 1. 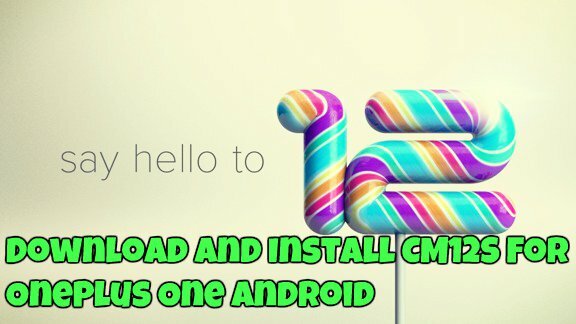 Download the CM12S Android Lollipop Zip file for Oneplus one here and Don’t extract the folder. Step 2. Move the downloaded ZIP file on the phone. You need to flash this file manually form the recovery mode. Step 3. Turn of your Oneplus one and boot into recovery mode. To do this Press Volume Down + Power button. Step 5. After that Go back and start the flash process. Step 6. Tap on install. And Locate the CM12S zip that you moved on you phone one Step 2 and Flash it. Step 7. One the flashing process is done. Reboot to system. Step 8. The first boot will take 5-6 minutes. Enjoy! Now your phone is running on CM12S Android Lollipop.